- For optical, neutron and particle beam experiments. The Cryogenic range of split pair magnets allow strong magnetic fields to be produced in a small volume with maximum access to the working space. Split pair coils can be mounted to provide either a vertical field with horizontal access or a horizontal field offering horizontal or vertical access. The standard design for split pair solenoids available are in the range 1 to 10 Tesla. Large windows in the support structure between the coils allow access to the sample. This configuration forms the basis of the Cryogenic Optimag series of split pair magnet systems. For other applications with neutron beams, a thin walled aluminium former and aluminium windows will allow transmission of neutron beam and thus access to a sample. Wide angled scattering can be dedicated perpendicular to the field diameter. Where possible standard coil designs are used to meet customer requirements but as many applications for split pair are of a specialised nature, bespoke designs can also be provided for. The standard solenoid range of magnets offer a homogeneity of 0.1% homogeneity within a 10mm DSV, whilst the standard split pair range offers typically 0.5-1.0% in a 10mm DSV. For applications which require a more uniform central field profile Cryogenic offers a range of high homogeneity coils. These coils are denoted by option codes as shown in the link below. Higher Homogeneity coils are in general of extended length, typically from 30 to 50% longer and may be up to 10% larger in diameter. All coils can have a stability in persistent mode of 10-7 per hour or better. Cryogenic's range of top and bottom loading He-3 low temperature inserts permit the cooling of samples to below 0.3K. The He-3 inserts can be directly exchanged for the standard Variable Temperature Insert (VTI) as both units are self contained. By this means the same cryomagnet can be used for experiments over the range 1.6K to 300K with the VTI and 0.3K to 100K with the He-3 unit. Using a small dilution unit the temperature can be reduced to a few mK. Cryogenic manufactures a range of He-3 inserts to suit many different user requirements. The two major styles of insert differ in the thermal contact to the sample. With the Top Loading Insert the sample is mounted on a long probe which is inserted through the gate valve and an airlock (see diagram), thus allowing for rapid sample changes whilst maintaining the He-3 charge. The probe passes right down to the bottom of the insert where the sample sits in a pool of liquid He-3. With this system it is easy to change the sample in the same way as with a conventional VTI. The Bottom Loading Insert allows access to the sample by lifting the insert out of the cryostat and removing the lower part of the vacuum jacket. The sample is placed on the lower face of the He-3 pot thereby being directly conduction cooled. The Bottom Loading inserts are useful because they use very little He-3 and they can be built small enough to fit inside small cryostats or storage dewars. Cryogenic offers a wide range of variable temperature inserts (VTI's) with the availability of 3 different temperature ranges; 1.6K - 100K, 1.6K - 300K and 1.6K - 400K the available standard units have sample spaces from 18mm to 48mm. 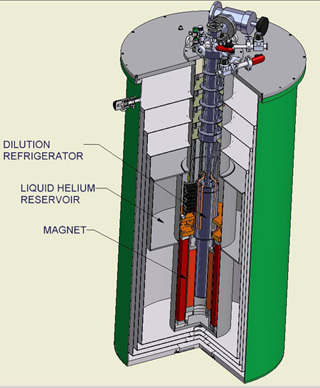 A typical VTI consists of a cryostat containing a pool of liquid helium to cool the superconducting magnet and an insert which controls the temperature of the sample. The VTI operates by drawing liquid helium from the main cryostat bath through a filter and a needle valve. The liquid He-4 passes through a heat exchanger into the sample space and is then pumped away by a room temperature vacuum pump. An integral heater and sensor on the heat exchanger allows the temperature to be set to any value from 1.6 to 320K. As an option Cryogenic supplies motor driven needle valves so that the helium flow rate can also be controlled from the computer. Cryogenic Ltd offers a custom design dilution refrigerator inserts with separate vacuum top loading tube for STM and other UHV applications. The insert is compatible with our standard low-loss liquid helium cryostats with superconducting magnets. field up to 16T or vector magnet 9T-2T-2T. Cryogenic has many years experience in the design and manufacture of custom made magnet systems. The company is well placed to help customers plan new projects involving magnets and low temperatures. The company designs and builds tailor-made systems for many applications. Recent projects have involved magnets for nuclear research, industrial mineral separation, magnets for MRI and other medical applications. Illustrated is one of the larger horizontal magnet field systems, a 6 Tesla 600mm room temperature bore cryomagnet. 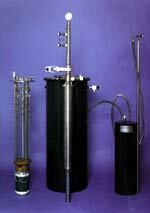 Cryogenic Ltd. offers a complete range of standard low-loss helium cryostats to suit every application. 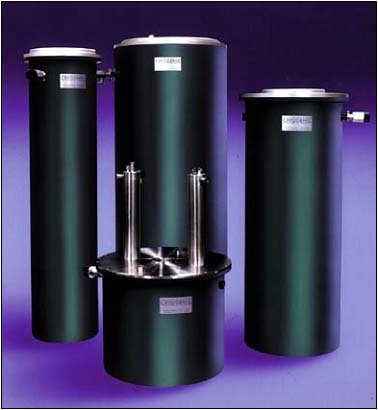 The modular designed cryostats are offered with both gas and liquid nitrogen cooled radiation shields. Both bucket and reservoir styles are available. The standard range is assembled using stainless steel providing the benefit of rugged lightweight construction and low helium loss. If required glass fibre construction is offered as an alternative. Standard models have a 1250mm internal depth and 1350mm overall height. The base of the reservoir is fitted with an RhFe temperature sensor and a heater. Liquid nitrogen cooled shielding is available for all models where minimum consumption is a priority. 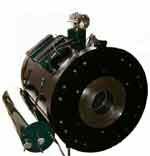 Optical access into the reservoir cavity is available in various configurations. Window materials are chosen to ensure maximum transmission at specific frequencies. A wide range of window diameters is available, typically from 10mm to 25mm. In addition to our standard range Cryogenic manufactures custom cryostats for special applications including biomagnetism, beam line experiments, MRI, and Mineral Separation.